Fall is upon us! This morning it was cool and breezy, sunny and clear! It makes me very excited about the fall. I know it will probably be hot today and likely humid next week during recess, but I look forward to cool weekend mornings and running long without waking up at 5am. I just ran a small loop around Rt. 1 and Lafayette. The highlight was seeing a chicken on the side of the road on Rt. 1. At least I think it was a chicken. It looked like this, but maybe a little lighter brown. After running I went to Loriella Park for the Chancellor Invitational. I don't remember the last time I went to a high school cross country meet. Probably some sort of William & Mary Invitational. I don't think I ever got to any of Anne or David's meets when they were still running in high school. I saw a lot of people I knew that I run with, but otherwise it was a sea of strangers. Some high school kids from the Stafford County schools looked familiar, but I figured they were younger siblings of kids I knew previously. Stafford High School had 4 kids run faster than I did there my senior year when I was #1 on the team and #7 in the field, and I don't even think those 4 kids were all in the top-15. They did have #2 though, and probably finished 3rd behind Colonial Forge and Mountain View. In the girls race I watched it with Blaire Morris to cheer on some of the JM girls whose names I actually knew from knowing their moms. Colonial Forge looked to have the race in the bag at 2 miles, but running behind their 5th girl was the entire top 5 of Midlothian... not just 5 in a row, but 5 girls running together within arms reach of each other. I look forward to seeing how that worked out as the Midlo girls moved up a lot in the last mile to break up the Forge top-5. Forge did have the low stick with #2, 70 seconds behind the winner from Stafford. In fact both winners were runaways. Now it's off to VA Beach. KC and I both have sinus infections so we'll have coughing contests in the car. Hooray. Also of note, yesterday I went to VA Runner to buy a bog of GU. I am officially out of gift certificates, and for the first time in recent memory I had to give them money. Granted it was only 10 cents, but still. The economic crisis is finally being felt by my wallet. They nickel and dime you, that's for sure. Thanks for commenting on my post. I will review your comment as soon as possible. I'm a Graduate Fellow at the Curry School of Education at UVA in Charlottesville and I'm a member of the Ragged Mountain Racing Team. 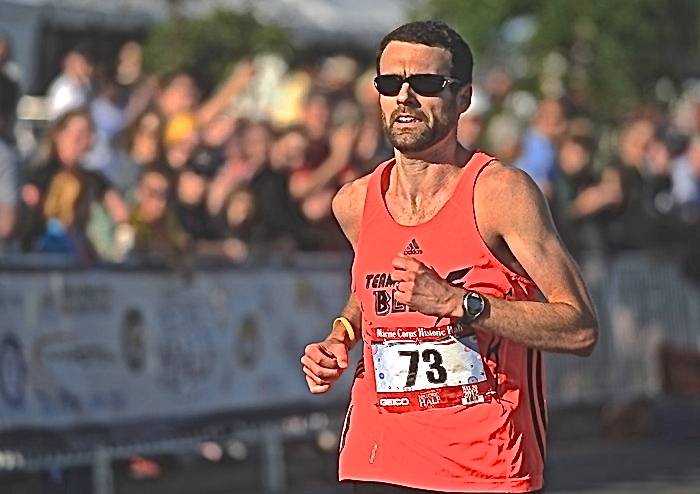 I'll run anything from the mile to the marathon, and have competed in several big city races. This is a blog for my workouts, races, and other things I think about sharing.